Have you dreamed of having fun and making money while cooking delicious food? Well, dream no more! Today we're going to learn all about the wonderful world of catering. You'll find out what the catering business is really like. We'll look into the ups and downs of having a home-based business. You'll get to explore your personal skill set. And finally, you'll do some cooking. Chefs often say that the key to great cooking is using quality ingredients. But what exactly are quality ingredients any way? After today, you'll know what they are and how to choose them. You'll also learn how to build your personal pantry so that you always have the right tools on hand for any kind of catering activity. And you'll get what every caterer needs: several exciting and delicious recipes. Since we're first attracted to food with our eyes, delicious food also needs to be beautiful. In this lesson, you'll discover techniques for making any dish visually attractive. You'll learn how to arrange and present food in creative ways. You'll find out about easy and effective garnishes and how to work with them. And then you'll get to practice your new skills with several recipes. Appetizers and hors d' oeuvres are an important part of any catered meal. So in this lesson, you'll learn how to pair appetizers and hors d' oeuvres with entrées. You'll see how to make them attractive and how to present them to your guests. And last, but not least, you'll get several tried-and-true appetizers and hors d' oeuvres recipes. Today you'll learn the secrets caterers use to prepare delicious main courses. You'll find out how to choose the best main course, select the right ingredients for them, and serve them to your guests. And you'll have the opportunity to prepare several main courses. From brownies to cheesecake, everyone loves dessert! So today we'll explore different kinds of desserts and how to choose the right one for your event. You'll learn a number of dessert-making secrets and you'll have an opportunity to prepare several of them. Drinks are an important part of any meal. As a caterer, you'll always want to serve beverages that are refreshing and unique. So in this lesson, you'll learn all about teas, coffees, and punches. You'll get delicious recipes you can try and you'll see how to garnish drinks for that extra special touch. Stemware, flatware, dishes, oh my! Don't worry: serving dishes don't have to be cause for great concern. With just a few tips and tricks under your belt, you'll learn how to choose the best serving dishes and flatware for any occasion. Today you'll see how to keep things practical, but still make everything beautiful. You'll also learn how to formally arrange flatware for any occasion. And of course, you'll get more recipes. Condiments and sides are a critical part of a great meal. They can also be a big headache. But with the skills you'll learn today, you'll be able to provide condiments and sides without any fuss. You'll find out how to serve them easily, safely, and without a bunch of problems. Menu planning may seem a bit overwhelming. After all, combining the right items with the right event can be difficult. But you can master this planning skill! In this lesson, you'll learn to create the perfect menu for the perfect event. You'll see how you can manage menu items and keep your menu from becoming boring or too complicated. You'll even find a number of sample menus and recipes you can use for your events. Since catering is a business, you'll need to manage expenses and turn a profit. Today, we'll cover managing the business of catering. You'll learn how to price menus, figure profit, track your income and expenses, create contracts, and arrive at a healthy bottom line. You'll also find out how to set personal boundaries and take care of yourself so that your catering business doesn't overwhelm your life. In this lesson, we'll walk through a day in the life of a caterer. You'll see how to work with your client, how to help your client choose the right food, and how to get a signed contract and down payment. Next, you'll discover how to organize your time, plan the event, and deliver your first job with great success. 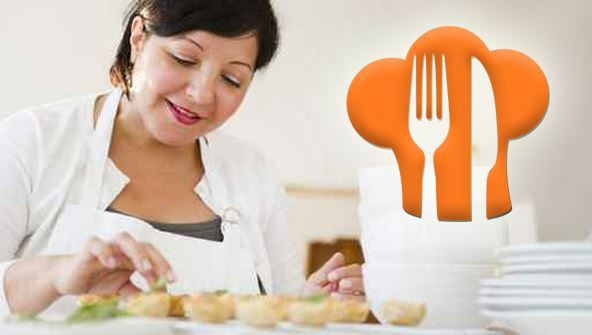 Using what you learn today, you'll be able to plan and complete your first catering job!